The amount of oil and gas produced in the UK is set to increase for the first time in 15 years, according to a leading energy body. Oil and Gas UK said early figures show production over the first six months of this year could be 2.5% higher than in 2014, suggesting an overall rise in production this year. The newly-opened Golden Eagle field, which began producing oil last year at a rate of up to 18,000 barrels a day, is partly responsible. Deirdre Michie, chief executive of Oil and Gas UK, said: "Recent provisional figures from the Department for Energy suggest that oil and gas production from the UK Continental Shelf over the first six months of this year could be 2.5% higher than the same period last year. "It's still early days, but initial indications suggest that production could increase for the first time in 15 years. "Provisional data for the first six months of 2015 show liquids production to be up around 3% and net gas production to be up around 2.5% this year, compared to the first six months of last year. "Production in the second quarter of the year looks particularly encouraging and early figures suggest that May saw the most oil and gas produced on the UKCS since March 2012. "We will be able to discuss annual estimates with more certainty by the end of the summer maintenance season, as figures for July and August are historically the most uncertain." Despite the predicted increase in production, the UK's oil and gas output has fallen from 130,000,000 tonnes a year in 1995 to less than 40,000,000 in 2014 and a slump in the value of oil has led to industry-wide cutbacks. The cost of a barrel of Brent crude hit a six-month low of $50 on Monday amid concerns about a global oversupply and slowing demand in China, one of the world's largest oil consumers. 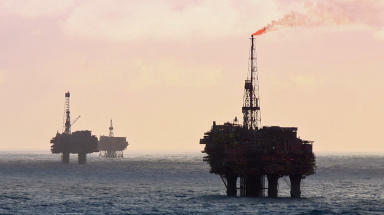 A boom in US fracking and shale gas production has also put pressure on the North Sea. Updates: Would you like STV's latest news update in your inbox every morning? Choose from our range of regular e-newsletters here.